I've been sharing a lot of full album reviews here lately, mostly because the web has been eerily quiet with decent sounding new music. It's not that a lot of new stuff isn't being released, just that I haven't found much that is worthy of sharing here. It has been pretty boring at most of the blogs I frequently visit. Of course, due to the obvious time constraints, there are only a handful of blogs I frequently visit, mostly focused on the styles of music I most enjoy. I first discovered Tamaryn earlier this year when I blogged about a new song the San Francisco act had just released called I'm Gone. 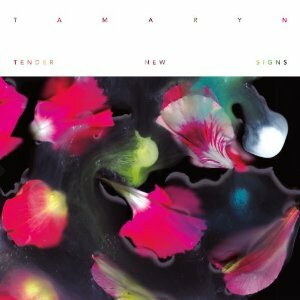 Last week marked the official release of the brand new album "Tender New Signs." Vocalist Tamaryn is a New Zealand-born singer with a dreamy, mostly low-end voice, at least as far as female singers go. Her pitch and timbre fit the music well and are precisely what you would expect. This predictability is not so much a mark against the band as it is a sign that the vocals won't go horribly awry in any of the songs on the disc. Tamaryn's vocals are similar in style to those produced by Spc-Eco, but more spaced out. Shoegaze music generally has a flair of same-sounding song structures that can get annoying if not varied enough. While Tamaryn does vary the music in both tempo and beat, it is not enough to offset the otherwise flawless production on this disc. This proves to be my only beef with the album, though thankfully the running time is relatively short. This band consider themselves 'skygaze' owing to the heavily distorted guitar and keyboard lines that lend themselves to an atmosphere similar to what some ambient musicians employ. There is a lot of looping on this disc in both vocals and instruments, so this style of music definitely is not for everyone. Some songs do lend somewhat an aura of dream pop, but these tendencies are brief and well-spaced. Overall, this is a decent record worthy of a few listens. It is not something I would listen to on repeat, but for random spins once in a while, it is not a bad album at all. Check out the official video for Heavenly Bodies below, and pardon the preceding advertisement. Thanks for listening and enjoy!